Officially the world’s longest-running and most sought-after tribute to the BBC’s iconic sitcom – it’s back! Basil’s still rude, Manuel’s still confused, and Sybil’s still cracking the whip... but because the show’s highly interactive and 70% improvised, it’s never the same twice! 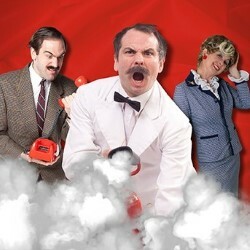 Be served non-stop laughs and a three-course meal in this internationally acclaimed hit. ‘Glorious entertainment of the highest calibre’ ***** (Fife Today). ‘Brilliantly talented cast’ ***** (Sun). ‘Hilarious’ ***** (The Holiday and Travel Magazine, Sydney Opera House). ‘Catch it before it leaves’ ***** (Best of Toronto, Sony Centre for the Performing Arts).